I had just returned from taking my children on our every-weekday run to the school bus stop. We had the radio on, not to my usual NPR station but to my son’s favorite “warm” music station and the tune that came on as I pulled back into the garage was Michael Jackson’s hit of 1983, “Beat It,” a song whose lyrics I’d never really listened to until this morning. So I had my “garage moment,” as others have their “driveway moments” — those moments you stay in your car listening because the story (or in this case tune) on the airwaves captures something in you. And so it was with MJ this morning, and I did my driver’s seat dance. My daughter never liked Jackson, thought he was “creepy,” but she only knew the Michael of the later era, not the cute, wide-nosed version who sang “Rockin’ Robin.” On the day Jackson died, we teased her that her favorite singer was gone. In response, she rolled her eyes at me. So now here I am, writing this at the counter in my kitchen because, from beyond his grave, Michael is reminding me to finish the project I started more than a year ago. Here is a picture of a glove I own. 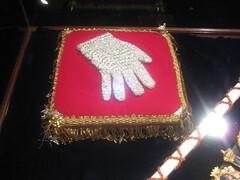 Those of you who have seen, or own, such a thing know this is no ordinary glove. It’s a compression glove, made of strong, highly elastic fabric, custom designed in Germany. Yep, ugly. That’s precisely what I thought when I brought it home about 2 years ago, and its presence in my house depressed me for awhile. You see, this is the glove that I will have to wear periodically to combat the swelling that occasionally appears in my left hand. This swelling, known as lymphedema, is the result of the removal of about 23 nodes from under my left arm during my surgery for breast cancer. Lymphedema is not related only to cancer surgery or only to the arm. It can occur in anyone whose lymph system is disrupted anywhere in the body. About 8% of women develop lymphedema after breast cancer surgery, and the risk increases with radiation therapy. Twenty-three seems like a lot of nodes, but since no one knows how many any of us has, we have no way to gauge the damage done by their removal. I once read a report of a woman who had 66 nodes removed. Herein lies yet another mystery of the human body. The overall surgical procedure for someone with breast cancer has changed drastically over the years, from the mandatory radical mastectomy, which my grandmother had for a pea-sized lump, that removes all breast tissue and much of the underlying muscle to the lumpectomy of today, which takes only the lump and a small portion of surrounding tissue. But even for a lumpectomy, the surgeon always checks the nodes if there’s any hint that the cancer has started to spread. Maybe the nodes “light up” on an MRI scan, or maybe they’ve actually started to expand enough to be felt physically, as did one of mine. The dye traces the path of the lymph nodes to the outer edge of the breast and up into the armpit, and the first node in the path is known as the sentinel node. It’s only been in the past couple of years that doctors decided it was enough to remove only the sentinel node for testing rather than a whole batch of them. If the sentinel node is clear, no other nodes are removed. If it’s not, the patient is scheduled to have chemotherapy. But it doesn’t matter if it’s just one node, or 23, or 66 that are removed. Along with permanent numbness under the arm from nerves that are severed during surgery, you are now at risk for developing lymphedema because the lymph system is disrupted. And it can show up at any time — 2 days, 2 months, or, in the case of one woman I know, 12 years later. In my case, it was almost 2 years past surgery. We had been traveling and I noticed some slight swelling on the outer side of my left hand. The swelling disappeared about a week later, and I decided it was perhaps the effects of the air travel, even though I’d never before had trouble with swelling when traveling. When it reappeared and crept up into my fingers, I realized with sudden sadness what it was. That’s the thing about cancer. You can beat the disease but there is always the aftermath, and it often seems that it never ends. So even though the swelling was slight, its occurrence plunged me once again into a very dark place, and the confidence I’d gained, almost 2 years on, blew away like leaves on the wind. It’s at these moments that you must begin again, simply because there is nothing else you can do. The oncologist confirmed that the swelling was likely lymphedema, the trigger for it unknown. (The experts say it can be anything that stresses the lymph system, from a mosquito bite to air travel.) He sent me to a therapist who specializes in treatment. 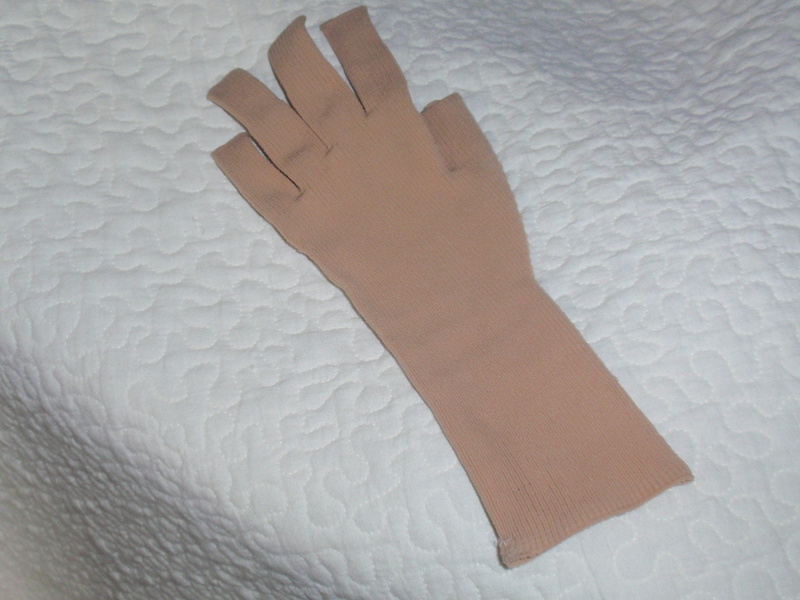 She had been trained in Germany, where the study of lymphedema is far advanced over ours here in the U.S.
After massaging the hand, arm and chest, the therapist carefully measured my hand — across the palm and the back of the hand, along each segment of each finger — to write up the order for the glove. Over the course of 6 weeks or so, with ongoing massage and the procurement of two gloves (the first one returned because it turned my fingers purple) the glove and its matching sleeve, which is to be worn in tandem to keep lymph flowing throughout the arm, the swelling surprisingly disappeared. But the mind plays us for the fools we are. It lets you think that, once you’ve faced the danger, once you’ve paid the dues, you won’t have to do it again. So what if the glove and sleeve together cost about $600? I was happy to see that version of money lying uselessly in my drawer. But then, last week, I turned my hand just so, and felt that painful pull in the skin, this time on the inner side over the knuckle of the index finger and toward the thumb. There were also the transient aches and twinges in my arm that told me the lymph fluid was getting backed up again. The mental plunge was not as deep this time because now I had the wisdom of experience. I didn’t run to the therapist, didn’t even call my usual massage therapist, who is also trained to treat lymphedema. I massaged the area myself in the way the therapist had shown me — clearing the lymph nodes in my groin first, then stroking down the side of my body, then down my raised arm, to send the stuck lymph fluid past the scars of surgery and into the larger nodes near my hip. 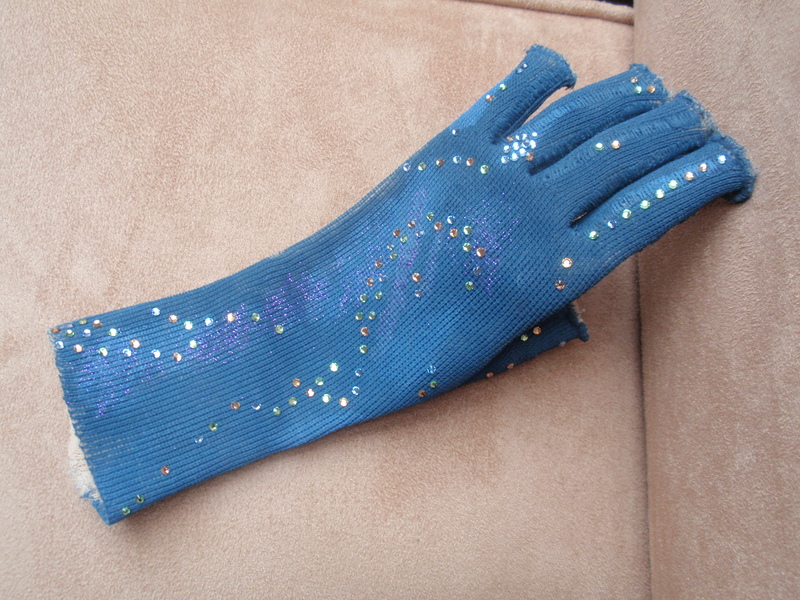 And I reluctantly retrieved the glove from the bottom drawer, where it lay hidden beneath some slips and old pajamas. The swelling is once again dissipating with the help of the glove and some surprising activities, like writing comments on student essays. I am left-handed, and the fine motor movement of writing is helping to pump the lymph fluid out. At last, I’ve found a tangible use for grading papers! In my first bout of swelling, when I thought I’d be wearing a glove every day, I dreaded having to explain to people why I was wearing that ugly old thing. So I decided I’d disguise it, do something to either deflect attention from it or call it into the limelight because of its style. And then I thought of Michael. Yes, you know it. That glove of his was my inspiration. I can’t afford the Swarovski crystals, but some fabric paint, a glue gun, and some cheap rhinestones are a pretty good imitation. WARNING: Decorating a compression garment like this, even with the artistic touches contributed by your daughter, will void its warranty, and make it less functional. Michael — you did us all a disservice with the drugs that took you away too soon. But your music has inspired me now to finish my work. Your song is about running away from bullies. My glove is about standing up to them.